"Cutting-Edge Insight For Sales And Marketing"
Today, the challenge for many organizations is that the variety of data needed for many innovative analyses is often locked away within other functional areas. Even with the inherent value in traditional customer applications, presently most compelling insights are actually derived by combining multiple different types of disparate data. 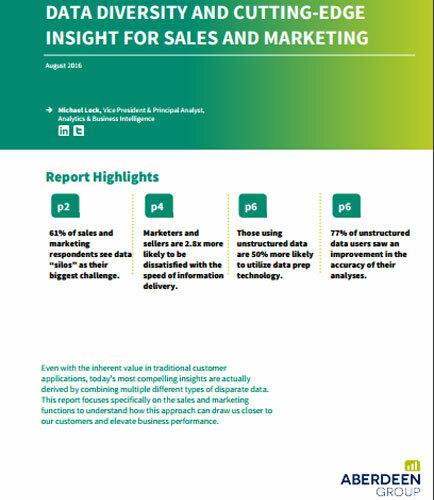 This whitepaper focuses specifically on the sales and marketing functions to understand how this approach can draw us closer to our customers and elevate business performance. What is Sales Growth ? The amount a company derives from sales compared to a previous, corresponding period of time in which the latter sales exceed the former. For example, a company has experienced sales growth when its sales were $1 million in Q1 2009 and are $1.2 million in Q1 2010. Sales growth is considered positive for a companys survival and profitability. It may result in increased dividends for shareholders and/or higher stock prices.